The Cigarette and Other Tobacco Products (Prohibition of Advertisement and Regulation of Trade and Commerce, Production, Supply and Distributions) Act, 2003 (COTPA, 2003) was an initiative of Government of India after signing an international treaty with 139 countries to reduce tobacco use in India under the guidelines mentioned in Framework Convention of Tobacco Control (FCTC). 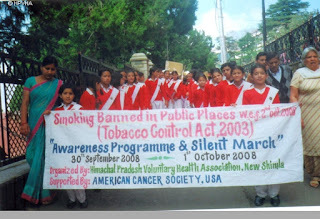 Himachal Pradesh was the second state in India who made an Act to save the people from the exposure of tobacco smoke in work places "The Himachal Pradesh Prohibition of Smoking and Non Smokers Health Protection Act.1997" popularly known as "HP No Smoking Act, 1997" but unfortunately the rule was not finalized by the state government. The Himachal Pradesh Voluntary Health Association (HPVHA) raised the issue with the state government by the time the central Act (COTPA, 2003) was came in to force in 2003 and the rule adopted in 2008. HPVHA started a campaign to aware the community members on the benefits of implementation the COTPA in the state. The organization started a signature campaign and submitted a memorandum to the then Chief Minister and Governor on 31st May, 2007. The organization works hard for funding this campaign as state government has not allocated not a single and was it was not covered under the National Tobacco Control Programme as the prevalence of Smoking tobacco was higher than that of India in the state. The officials and masses in the state were not so sensitized and the campaign was not come up with the full swing. Thanks to Ms. Asha Swaroop, the then Chief Secretary of the State who agreed on organizing a workshop for Principal Secretaries, Secretaries, Directors of all key departments of the state on 5th May, 2009. The contribution by The International Union Against Tuberculosis and Lung Disease (The Union South East Asia Office, New Delhi), Voluntary Health Association of India (VHAI), American Cancer Society, Hariday Shan and Helis Shekhsaria Institute of Pulbic Health Mumbai and other organizations who supported the campaign in the state through small workshops for different stakeholders. The campaign was recognized at international level when HPVHA has declared Shimla city second Smoke Free city in India on the bases compliance survey conducted by The Union in May, 2010. 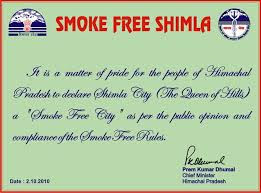 The Government of Himachal Pradesh had declared Shimla City as Smoke Free on 2nd October, 2010 by signing a Certificate. This added big mileage to the campaign and international organizations like WHO felicitated HPVHA as WHO SEAR award on WNTD, 2011. The people of different parts of state were demanding to implement the COTPA provisions in Himachal Pradesh for making public places free from tobacco smoke exposure. International Civil Society The International Union for Tuberculosis and Other Lung Disease under Bloomberg Initiative to reduce tobacco use come forward for funding. 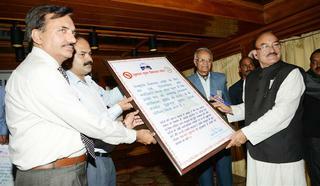 The Smoke Free Himachal was launched in May 2011 for two years. Following are the main objectives of the Smoke Free Himachal. The State Government had declared all 12 District Head Quarter as Smoke Free on the bases of survey conducted by health department on 31st May, 2012 and the WHO had felicitated state government with WHO award in 2012. In May 2013 the district administrations have started declaring the whole district as Smoke Free by declaring Kullu as first Smoke Free district on 27th May, Lahaul and Spiti on 28th, Kangra on 29th and on 31st May on the occasion of WNTD, 2013 Solan (10:45 AM), Una (12:40 PM), Chamba (1:20 PM), Hamirpur (4:36 PM) and Sirmour (4:37PM)as 4th, 5th, 6th, 7th and 8th Smoke Free district respectively. On 7th June Bilaspur and Mandi as 9th and 10th district respectively and on 14th June Shimla as 11th Smoke Free district of state. Sh. Kaul Singh Thakur, Health and Family Welfare Minister, Govt. of HP has declared the State of Himachal Pradesh as the India's first scientifically evaluated state on 2nd July, 2013 by signing a Certificate at Hotel Holiday Home, Shimla.